The word “sadsad”,in the local dialect, means dance. This is where the Sadsad festival got its name. The Sadsad festival is held in honor of the patroness, the Immaculate Concepcion. It was started in Barangay Poblacion but was later elevated as the town festival when the barangay captain became the mayor of the town. It was originally in honor of barangay Poblacion’s patron saint, San Roque, that was honored by the said festivity. When Brgy. Poblacion’s barangay captain became Mayor of the town, he elevated the barangay festival inot the official town festival and changes its celebration from March (San Roque’s feast day) to December (Immaculate Concepcion’s feast day). This year, the Festival’s name was changed from Sadsad Festival to Sadsadayon Festival. It comes from the two segments, Sadsad and dayon. Sadsad, which means dance, has been retained. Dayon came from two visayan words, “dayon” and “padayon”. Dayon, meaning welcome, was used because Oslobanons are known fr their hospitality and is always shown during their annual town fiesta through dance. 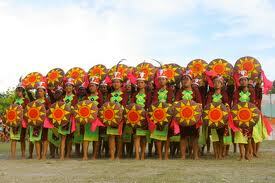 Padayon, meaning continue, was used because Oslobanaons are supposed to continue their traditions in rejoicing every after victory and to continue the good values which they have. Thus, this year, the Sadsad Festival was renamed Sadsadayon Festival.